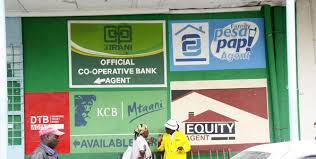 The financial institution sector in Kenya has created job opportunities for many people through their agency banking service. People have access to banking services such as deposits, withdrawals, paying school fees, bills and opening bank accounts right in their backyard. Agency banking has proven to be a successful venture and a means whereby people can invest a little capital. HOW TO APPLY FOR AN AGENCY BUSINESS The requirements in order to begin are as follows; 1. An Identification Card 2. Opening an account with the affiliate bank. This is the account to be used for business transactions as well as where you will get your commissions. 3. Certificate of good conduct. 4. Pin number certificate. 5. Business name (registered or unregistered). 6. Business Permit. BEFORE YOU BEGIN.... The goal of any business is to make profit and be a source of income for the individual.In order for this to happen you need to be honest with yourself and ask if you can handle the responsibility of running a business. Being self employed requires discipline and alot of sacrifice.No one is there to monitor you as you are your own boss.The success of the business will therefore depend on your own effort on a daily basis. You will also need to explore the environment where the business will be set up. How many similar services are around and if many, how do you intend to overcome the competition? Check out things like population, and security before you begin. It is all about being one step ahead of the rest. TIPS ON HOW TO SUCCEED AS AN AGENCY BANKER After meeting all the requirements when applying, you wait for at least one month to get approval, training and acquiring the equipments such as the POS machine, transaction registries and so forth. Once you begin operations the goal is to benefit from this investment. Here are tips that will help you succeed. 1.Branding means advertising your business and bringing awareness to would be customers. Make sure you use big bold words and let your theme color be associated with the bank's color theme and brand.This way customers will know which service you are offering and from which bank. 2. You need to have at least kshs 100,000 operating capital. This is the amount you have invested in the business. It is advisable not to be tempted to use this money for other needs because when your operating float reduces, the number of transactions reduce, your customers reduce and your commissions equally reduce. 3. Invest in security. This is the kind of business where you are dealing with large amounts of money all the time. It makes you vulnerable to people who have ill intentions like thugs and con-men. You can avert this problem by investing in security gadgets such CCTV cameras, money detectors, alarm systems and bullet proof glass. Insure your business from common risks like theft, fire and vandalism. Amazon has some amazing security gadgets at affordable prices.Check them out via the links provided. 4. Always ask for customer I.D before transacting. Avoid becoming a victim of fradulent dealings by ensuring to ask for customer I.D before doing any transactions. Many agents who have been caught not asking for I.D have ended up paying heavy fines or loosing their agency licence. 5. Always establish a good rapport with customers. The agency business is a competitive one and you can rise above it by providing quality customer service.You will draw customers to your business like a magnet by polishing your basic public relations skills and treating customers with respect. 6. Build your reputation by always have enough cash float to cater to all customers.Your business will thus have a reputation of never turning away its clients which will in turn make it grow. 7. Be money wise and disciplined when it comes to spending. Saving is a necessity for every business to succeed. Make it a priority to save at least 20% of your daily profits. You can also re-invest your commissions back into a business and this will facilitate growth. 8. The early bird catches the worm. Be an early riser and let your business be known for opening its doors early, preferably 8 a.m. 9. Keep a record of your transactions everyday. Know how much goes in and how much goes out. This way you will be able to track the progress of your business. 10. One final tip to succeed in your business is prayer. Always pray for your business and ask for blessings and favour everyday. Prayer not only provides spiritual support but it also nourishes and keeps stress away.. THINGS YOU SHOULD NOT DO 1. Do not accept a bank card(ATM) that does not belong to its owner. There are chances it may be a stolen card. 2. Do not keep you money in the open where it is visible to customers.There are many people who move around looking for targets to rob. 3. Do not be so obvious in your movements especially when going home and coming to work.Change the routes you take regulary to avoid being another case of kidnap and robbery. 4. Do not multi-task.Handle one customer at a time to avoid confusion and loss. 5. Do not reveal your business secrets to anyone. Not all people are your friends and such information may be used against you.